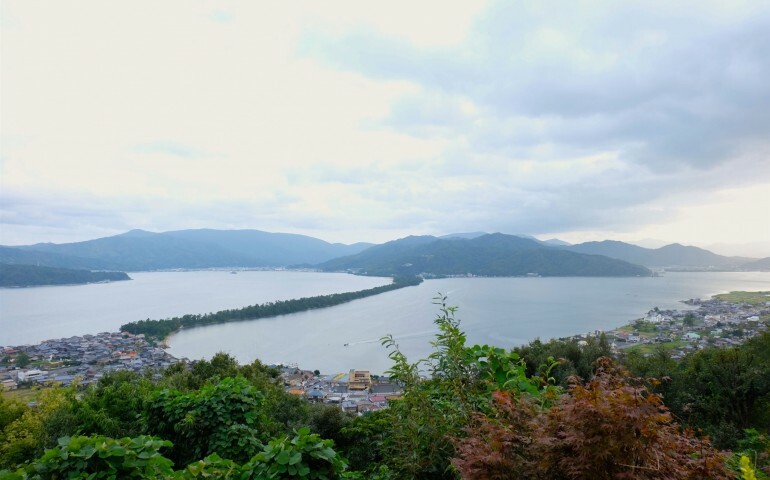 Visit Amanohashidate, one of Japan’s Celebrated Views! Amanohashidate, one of Japan’s three celebrated views! 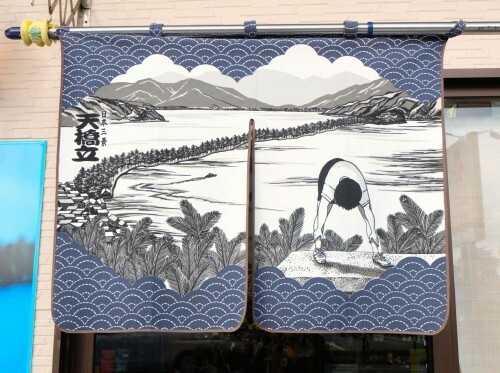 Have you ever heard of the Nihon Sankei or the Three Celebrated Views of Japan? 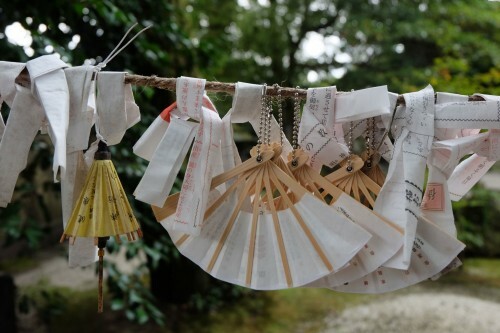 This canonical list is not just a list for tourists created on the internet; it dates back to 1643 and was written by Japanese scholar, Hayashi Gaho. The Nihon Sankei designates three locations in Japan to be as beautiful and wondrous as the seven wonders of the world, and according to Hayashi Gaho they are Miyajima in Hiroshima, the Matsushima Islands in Miyagi, and Amanohashidate, of northern Kyoto prefecture. 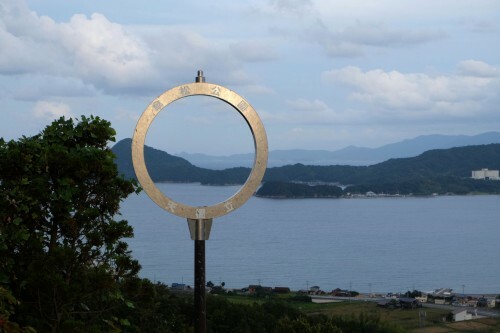 Throw a disc through the ring for luck on the northern side of Amanohashidate! The bridge itself crosses the Miyazu Bay, connecting Monju in the south (near Amanohashidate station) and Fuchu Park in the north (near Ogaki Station). The mountains in both areas have lovely scenic views accessible by ropeways and paths, but I recommend starting in the south and traversing the sand bar to enjoy what the bridge itself has to offer before taking in the sights from on high at the northern end. 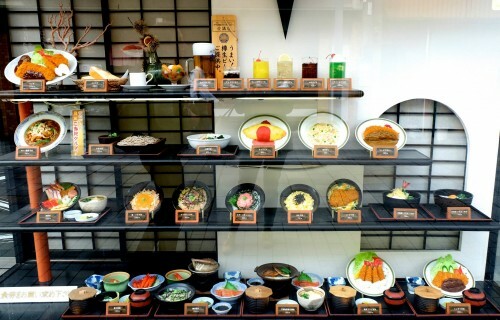 A little restaurant near Amanohashidate Station. The southern end of the bridge near Amanohashidate station is more populated with souvenir shops, hotels, and restaurants, a small theme park, and the beautiful Chion-ji Temple dedicated to the bodhisattva Monja. The trail on the sandbar is quite beautiful. 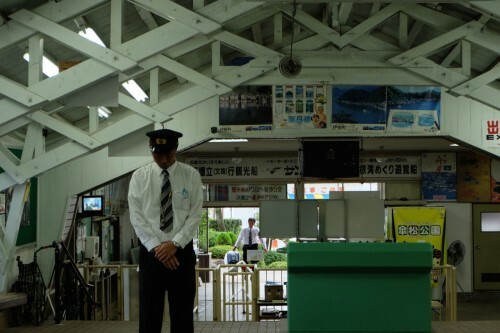 I recommend arriving at that station via the JR San-in and Miyazu lines from Kyoto, eat a nice lunch at one of the many restaurants around the station (hint: sashimi is very fresh in Northern Kyoto), and then rent a bicycle for the rest of the day to enjoy the town and the pine bar to the fullest. You can rent bicycles rather inexpensively, and can hold onto them until 18:00. Of course, if cycling is not your style, the sand bar is fully walkable – about 50 minutes on foot and 20 minutes by bike. The path is filled with gorgeous black pines, sandy beaches, and happy travelers. 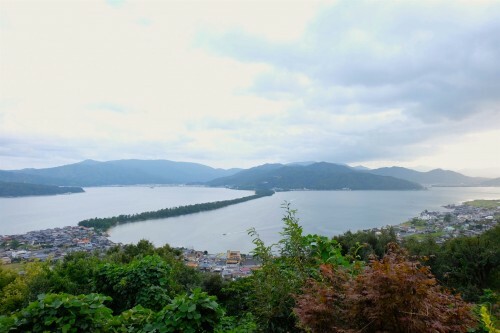 Along the way you can spot Amanohashidate Shrine, where the king of the Eight Dragons is said to be enshrined. 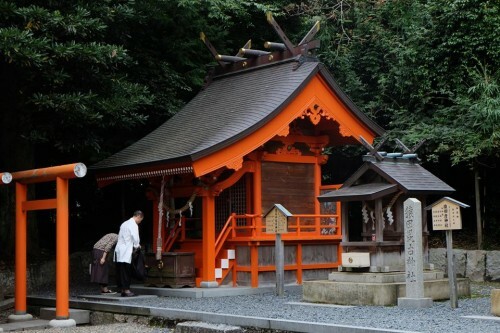 It is a very beautiful little shrine, and despite being right next to the seashore, it has a freshwater spring called “isokiyoshisui” for travelers to purify their hands in before approaching the shrine. A couple praying at Manai Inari Shrine, near the main Motoise Kono building. 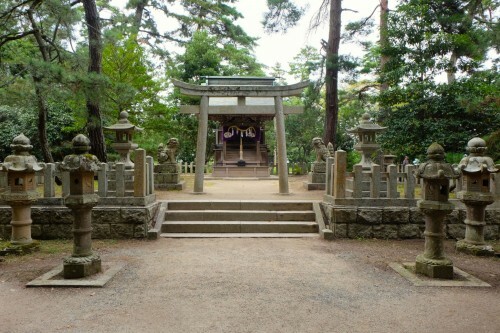 Once you reach Fuchu Park on the northern end of the bridge, you will find some more shops and restaurants as well as the Motoise Kono Shrine. 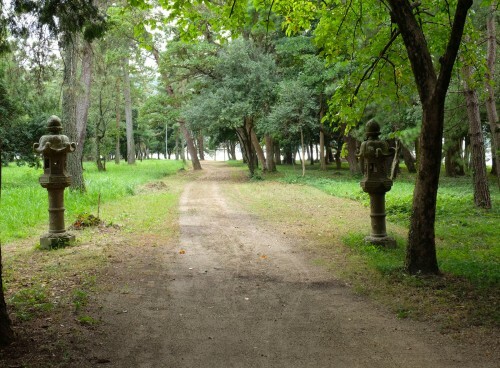 It is a beautiful shrine, and historically the most important shrine of the Tango Region. 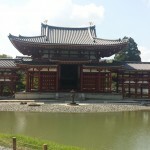 Within the shrine grounds, there are a few more smaller shrines built in various architectural styles and a lovely pond. Spotted at Motoise Kono Shrine. I had a lovely time walking around the shrine grounds and seeing many happy travelers who came from all over Tango to pay their respects. We parked our bikes, and headed up the ropeway to Kasamatsu Viewing Park at the top of the mountain. The ropeway costs 660 JPY for adults and 330 JPY for children. The view from Kasamatsu park was simply stunning! Even the design of the landing is quite modern and beautiful; the landing has railings made of glass so none of the view is obstructed. I was very happy to take many photos here; its the perfect place for a family portrait! Amanohashidate is well known as a place to do Matanozoki, in which you turn your back to the view, bend over and look through your legs so that the scenery is upside down. Doing Matanozoki at Amanohashidate reveals another side of the area, the mythical “Hiryukan,” or view of the flying dragon. Upside down with the sea as the sky, the sand bar appears as a dragon flying through the sky. 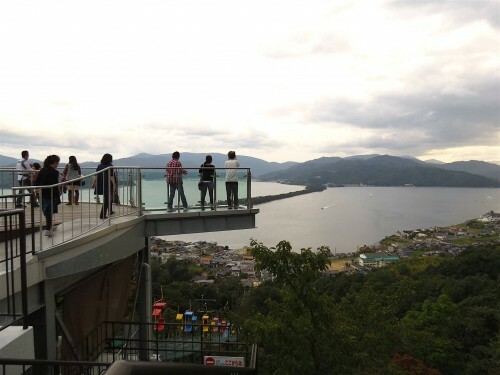 At Kasamatsu, there are even special viewing platforms for guests to safely view the scenery through their legs. 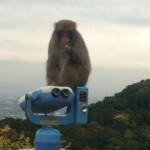 Matanozoki is embraced by all who visit Amanohashidate…even me! So don’t be shy, embrace the Matanozoki! See for yourself if you can imagine that dragon in the beautiful sky. 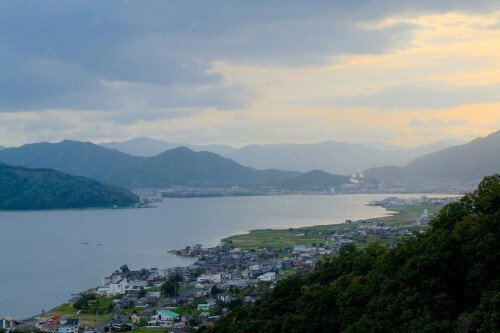 Head to Amanohashidate for a lovely day trip – you won’t be disappointed by this historically celebrated view of Japan. 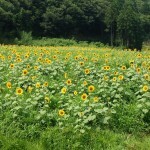 Northern Kyoto: Summer Sunflower Viewing in Tango! Togakushi, a beautiful place every visit near Nagano city. Californian artist on a life journey; loves collage, coffee, patterns and collaboration. Currently making artwork in different parts of the world, and sharing her travels along the way. Feel free to check out her art at www.easte-art.com!